A couple of months ago I partnered with Unilever’s Project Sunlight . This go around we are talking about world hunger. I will admit, when you eat everyday you tend to take for granted that you actually have food to eat! Alot of people don’t have food at all and this includes CHILDREN! 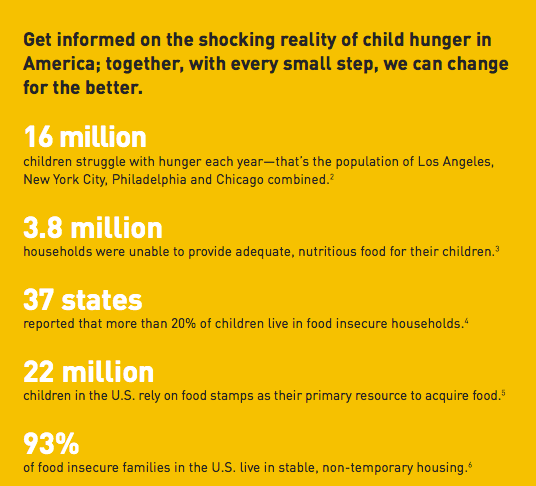 The Share A Meal program encourages us to do what we can to help stop hunger. There are many things you could do! You could go to a local foodbank, host a food drive, help out a neighboring family in need and much more. Please check out this video and share!